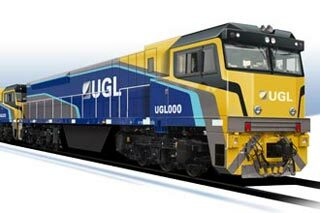 Australia-based UGL and GE Transportation, a subsidiary of General Electric, have unveiled their new PowerHaul Series locomotive (PH37ACmai) at AusRail Plus 2011 in Brisbane, Australia. The 1067mm-gauge version of the PowerHaul Series diesel-electric locomotive will be suitable for heavy-haul and freight operations across Queensland and Western Australia’s narrow-gauge networks, UGL said. UGL managing director and CEO Richard Leupen said that the company, along with GE, has developed the narrow-gauge locomotive product and it represents a considerable advancement in locomotive power technology. "The PowerHaul Series locomotive will provide customers with substantial improvements in haulage capability, emissions, fuel-efficiency, power and reliability," Leupen said. The PowerHaul Series will be the second locomotive from the UGL-GE portfolio of freight rolling stock products that is available to the Australian rail market, after the Evolution Series locomotive. The new series locomotive will provide customers with cleaner and more efficient rail technologies, meeting the emissions standards formulated by EU Stage IIIA and can be adapted to meet Stage IIIB. In addition, it will reduce CO2 emissions by up to 6% compared with current operating fleet averages, the company said. The diesel-electric freight locomotive will also deliver a 6% reduction in fuel consumption compared with current operating fleet averages in its class. It features Flexicoil bogies and GE’s Trip Optimiser system to facilitate fuel-efficient driving. GE Transportation has already delivered PowerHaul Series locomotives to Freightliner in the UK, which is branded as Class 70. The UK version of the PowerHaul however is different in appearance to the PH37ACmai, which will be built by UGL in their Australian based manufacturing facilities, though the two locomotives’ technology is similar. The Class 70 locomotives allow Freightliner to haul longer trains, transporting both coal and intermodal freight more quickly. Since 2008, UGL and GE have delivered about 70 heavy-haul Evolution Series locomotives to Rio Tinto Iron Ore for its mining operations in Australia’s Pilbara region.